The Yokogawa DPharp digital sensor uses two single crystal silicon resonators vibrating at their natural frequencies. When pressure is applied, one of the resonators goes into tension, while the other goes into compression mode. The CPU directly counts the sensor output frequencies without any additional A/D conversion. Due to the excellent elastic properties of silicon material, the DPharp sensor exhibits greater linearity and repeatability, with no inherent hysteresis. The resonant sensors also provides a large output signal resulting in greater sensitivity and higher turndown. Long term, accurate and stable measurement in real world conditions is fundamental to realize reliable and efficient plant operation. Transmitters in the field are subjected to continuous variations of ambient and process temperature, static and overpressure conditions affecting their accuracy. The long term stability of the transmitter is a measure of performance drift and dependent on the sensor technology. Total accuracy and long term stability determine the recalibration interval for the devices according to the acceptable performance levels. 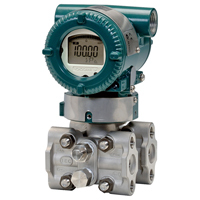 Additionally, the DPharp digital sensor has the unique ability to simultaneously measure static pressure and differential pressure. The multi-sensing platform enables real-time dynamic compensation for unmatched precision and forms the basis for implementation of advanced diagnostics. The information is available through various digital communication protocols, providing additional knowledge about your process. The multi-sensing functionality, with guaranteed accuracy of static pressure signal, allows the process to operate with fewer devices and delivering reduced lifecycle costs.